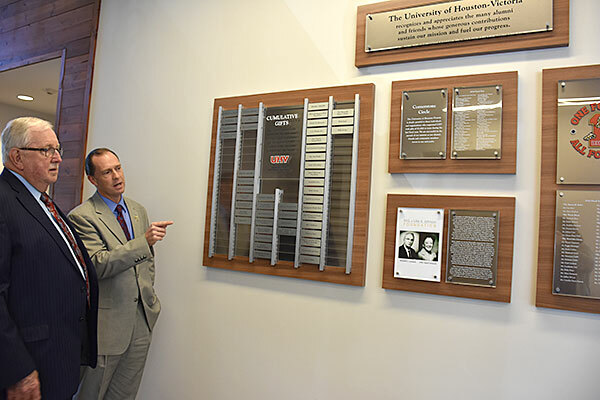 Jesse Pisors, right, UHV vice president for advancement and external relations, shows the university’s new donor recognition display to President Vic Morgan. The display is divided into four sections that recognize different levels of giving. The University of Houston-Victoria now has a new way to honor people and organizations contributing to the university. The university recently installed a donor recognition display on the wall outside the University North Multi-Purpose Room, 3007 N. Ben Wilson St. The display features 218 donor names. The display is divided into four sections to honor different levels of giving and different donor categories. The Cumulative Gifts section lists people and organizations who have given $50,000 or more to UHV during their lifetimes. These donors are honored with an engraved steel plate on the wall. The display features 43 individuals and organizations in this section, organized in six categories based on giving level, from $50,000 to more than $1 million. The next section honors members of the Cornerstone Circle, donors who have given $1,000 or more to the university during the previous fiscal year. The display will be updated every year and now features 66 donors from the 2016 fiscal year. Another section, also updated annually, will feature faculty and staff who took part in the university’s One For All, All For One employee giving campaign. As part of this section, a special identifier is reserved for the President’s Circle, which includes employees who contributed at least 1 percent of their annual gross salary back to the university. The employee giving section features 129 donors from the 2016 fiscal year, including 24 who were part of the President’s Circle. The last section features a donor, and it will be changed every quarter. This space includes a photo of one of the university’s contributors with a profile about him or her. The first featured donor is the M.G. & Lillie A. Johnson Foundation. University North was chosen as the location for the display because it is a common location for community events. The Victoria Chamber of Commerce hosts luncheons in the Multi-Purpose Room, and several other events have taken place in that room or the Kay and Ron Walker Auditorium on the first floor. The area also has room for the display to grow to include future contributors, Pisors said. To learn more about the donor recognition display, contact Pisors at 361-570-4829 or pisorsj@uhv.edu.